It’s not often that I sit down to interview expert and end up feeling like I’m catching up with an old friend. Within minutes I realise why Helen Piercy’s book and animation workshops have been so successful – she’s just someone you want to talk to. Telling me she has been fascinated by cartoons, comics and Disney from a young age, Helen has never wanted to do anything else. 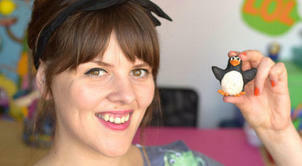 Graduating from the National Film and Television School, she decided to follow her dreams and bring stop motion to the masses. Passionate, dedicated and proof that hard work does pay off, if you’re looking for a reason to book an animation course, you’ll find it here. So Helen, you’ve always been interested in animation? Yes I have, from a very young age I’ve always been very creative and liked to draw. I watched cartoons from quite a young age on a Saturday morning and was just completely spellbound by animation. Luckily my dad was quite into computers, so I was always into technology as well and had access to play around with software. I also loved writing stories, so animation was a way of combining all three things. When I was very young I used to make videos using a really old fashioned camcorder; I would film my toys, press pause, move them, record and pause. It’s just something that has stayed with me as I grew up really; I just got obsessed with animation. What qualifications or training did you go on to do? I went to Norwich Art School; the first year of my degree was quite open, so I experimented with photography, publishing, illustration, animation and graphic design. When it came to specialising, I was thinking of doing graphic design, just because I didn’t really know how to get into animation – it wasn’t really around as it is now. The only animation I really knew was Disney and I remember thinking how am I going to get to America! I then decided I loved it too much to give up and had to follow my passion, so specialised in animation. From there I decided to do a masters degree and went to The National Film and Television School to do a two year course. Nick Park who made Wallace and Gromit went there so I thought ok that’s probably a really good course. It was brilliant, you work with all different departments; you go on an editing course, a production course and study sound design. You try out different techniques like hand drawn animation and stop motion. In the second year you decide what specialism you want to focus on and then you work with a team of people to make a film, just as you would in the real world. As you mentioned, there are so many different parts to animation, what is the part you enjoy the most? For me, I love character design, I love coming up with stories. The process is quite tedious, it’s very repetitive and you need to have a lot of patience, but I enjoy that too. I just love making things come to life – you are in charge of creating a whole world and the possibilities are just endless. I think it’s that kind of imaginary existence that I love about animation. When you say long and tedious, how long does animation take? Well it depends on what sort of animation you do and how involved it is. For something like Wallace and Gromit or Shaun the Sheep you have several characters and backgrounds, the team of animators can spend up to a week on a second of animation. On the other hand, if you are doing something on the computer, the process is a lot speedier. What’s the biggest challenge then for any animator? I would say you need patience and dedication to make it happen. If you want a job as an animator there are lots of different ways to do this; you can go into feature films, advertising and commercial work, studio based work or work as a freelancer. You should decide which career path works best for you. I think getting work and making sure your skills are up to scratch is a big challenge, so make sure you find a good course, develop your skills then decide where you want to work. I’ve had quite an interesting career path – I went to university thinking I was going to be the next Walt Disney, but when I graduated in 2009 the recession had hit and it was very difficult for me to get a job. I do all sorts of animation rather than work in one particular style, so found it very difficult to find my place in the world. I started doing workshops for young people and adults and applied for a job doing after school workshops and absolutely loved it. From there, I wrote my book which is called ‘Animation Studio’ – when you open it up it becomes a stop motion set. I think that was a really defining moment for me, when I thought right I’ve got something good and this is going to give me a lot more presence. That’s a really great story! What advice would you give someone hoping to follow in your footsteps? I think from the start, discover what your strengths are – are you good at drawing, character design, telling stories or patiently making the animations? Try as many different techniques as you can. Start off at home, make films and then book a course. I would definitely recommend animation festivals, they are a really good place to go and see animation that’s not solely cartoons aimed at children. What animators most inspire you and why? First of all it was Walt Disney because that is what I grew up with – the man was a visionary. Also my students inspire me so much, their imaginations are amazing and I’m so in awe of the things they come up with. Finally, an organisation called Animated Women UK, run by Lindsay Watson, which supports women in animation because they are slightly underrepresented at the moment. Finally then, what’s next for you? I’ve just launched my YouTube channel which is me presenting tutorials on how to make simple stop motion animations – I’m fulfilling my Blue Peter dreams! I want to do more tutorials about how to make different characters, which may be a link to do films and make stop motion out of that. I’ve also created a book with Zu3D, a software company that has made animation programmes dedicated to children. The handbook will be sold with their kits, which I use in all my workshops and that another step by step about making films. Oh and one more thing. I’m working with a company called My Mini Factory to create 3D characters that are poseable, so you can move and animate with them in a set. Wow, sounds like you have a lot on your plate – thanks so much for chatting and best of luck with it all! If you are itching to have a go at bringing your own characters to life, why not take a look at the animation courses listed here? Who knows where it might take you!